A handicap places greater emphasis on your more recent scores. For many people, golf is more than just an enjoyable pastime--it's almost a religion. Of course, not everyone who plays and enjoys the game is on the same skill level. But there is a way for players to compare their golf games even if they play at different levels. The tool that allows golfers to compare how well they played any particular game against a player who is technically better or worse than they are is known as a handicap. A handicap in golf is designed to level the playing field and to give golfers of different skill levels the ability to compete against each other. 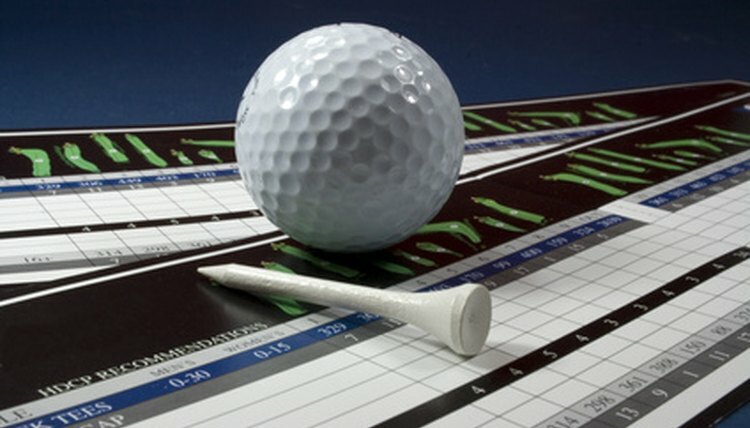 Gather the scores from your past five 18-hole rounds of golf. Look up the slope and the rating for each of the past five courses you played. The rating and the slope should be printed on the score card, but you can also call a course and ask for its rating and slope. Subtract the rating for each course from your final score at that course and multiply your answer by 113. Divide each answer by the slope for the course. This answer is known as your differential. Choose the lowest of your five differentials and multiply that number by 0.96. The result is your handicap.